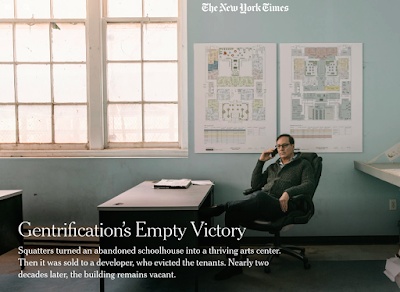 The New York Times today takes a deep dive on the 20-year drama that has surrounded the former P.S 64 and CHARAS/El Bohio community center on Ninth Street between Avenue B and Avenue C.
Developer Gregg Singer bought the property from the city during an auction in 1998. He wants to turn the landmarked property into a dorm called University Square, which continues in a holding pattern while the DOB maintains a Stop Work Order on the building. 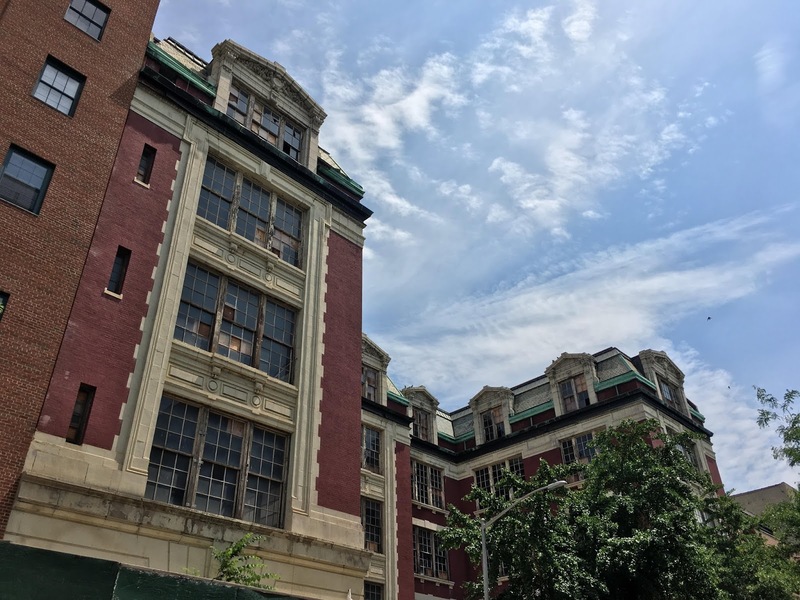 Community activists, preservationists and some local elected officials have long been opposed to Singer's plans, and want to see a return to use as a cultural and community center. The building became a community center after the school left in 1977. The group was evicted when Singer took over as the landlord. To date, as the article notes, Singer has filed several lawsuits (all unsuccessful so far), claiming that the city has obstructed his legal right to develop the property. Here are a few excepts from the article, written by Allegra Hobbs, who covered the neighborhood for DNAinfo. (She notes that Singer "remains insistently upbeat about the whole mess," and that during interviews with her, his tone remained "light and genial." Mr. Singer, director and president of his real estate firm, Singer Financial Corporation, does not buy into the displays of high emotion that follow the Charas legacy. 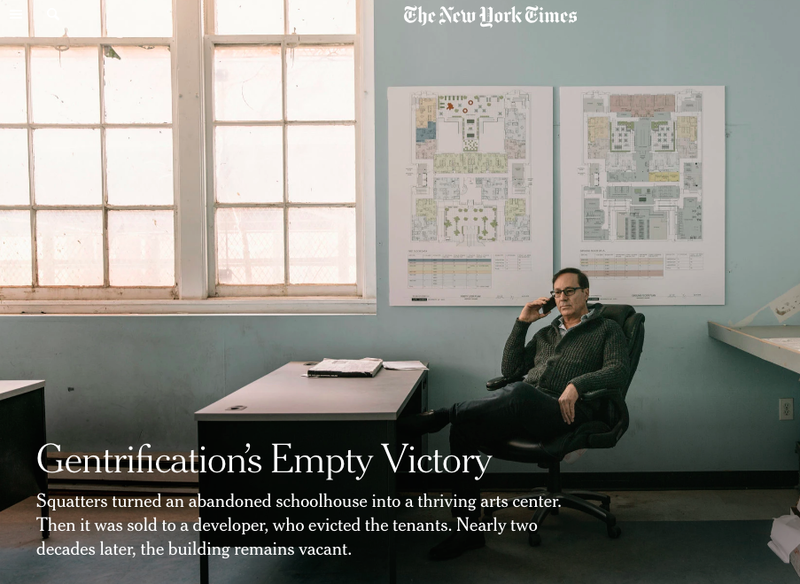 Where others see “emotional attraction” to the building, he said, he sees “nonsense.” On the day he bought the building and the crickets were released, he did not recognize a desperate last-ditch effort to save a beloved community center, but a clever ploy by opportunists to keep their cheap, illegal sublets. Mayor Bill de Blasio, meanwhile, has gone further, claiming in October that his administration is interested in buying back P.S. 64 — but no movement has come from City Hall to that end since his announcement, and the mayor’s office has declined to discuss the plan further. Mr. Singer detects a conspiracy, but the buildings department insists the developer is simply not following the rules. Mr. Singer visits P.S. 64 about once a week. The only part of the building not falling apart, abandoned, graffitied or coated with pigeon droppings seems to be his modest office on the first floor, decorated with pristine renderings of “University Square” — a “new college living experience,” as the brochures claim, where students would enjoy a theater, a game room, yoga studios and other amenities. It could be great for the community, he insists. Why wouldn’t the city want this? Why wouldn’t the community? You can find the full article, titled in the paper as "A Building Full of Empty Promise," right here. I'm surprised that de Blasio announced to a crowd of Council District 2 advocates that the city would buy the property, if it indeed has no firm plans to do so. He will make dedicated enemies if he does not follow through. An unforced error, since he personally had no political obligation to do such a thing before this. This Singer guy just doesn’t get it, does he? He has lost the battle, and he has paid the price for showing no respect for his opponents at every turn. It doesn't matter if the city buys the building or not. By announcing that the city would do so, DeBlasio has effectively killed off any deal Singer could possibly sign. With all of this uncertainly hanging in the air the property is basically worthless. It's time for him to move on, but pride, ego and hubris will not allow him to do so. Enjoy, the albatross Mr. Singer. hear it pairs very well with a glass of Trader Joe’s Two Buck Chuck. A dorm, Mr. Singer, is not "something for the community," unless you think the community consists entirely of a revolving door of students. Which is rapidly becoming true. The dormification of the East Village is destroying it. It's what I've said about the real estate industry: They will not lose. Ego and profit are a dangerous combination. We we, all New York, is poorer for it. IMO, Singer is dumber than a box of rocks (and I hate to disparage rocks that way). If I recall correctly, the buried lede in that story about Singer getting sued by his investors was that he's paying himself a princely sum to "manage" the property. The status quo suits him very nicely. He's not playing the long game. He's profiting handsomely as is, a fat and happy leech suctioned to the side of a gorgeous old neighborhood artifact and a pack of Wall Street sharpies who are probably going to take a big haircut when he's finally pried off. I'm grateful to de Blasio for at least acknowledging the injustice. But he needs to make it happen. Get this building back for the community. Restore it. Turn it into a school (desperately needed in the neighborhood today). Arts center. Community center. Anything. Make. It. Happen.